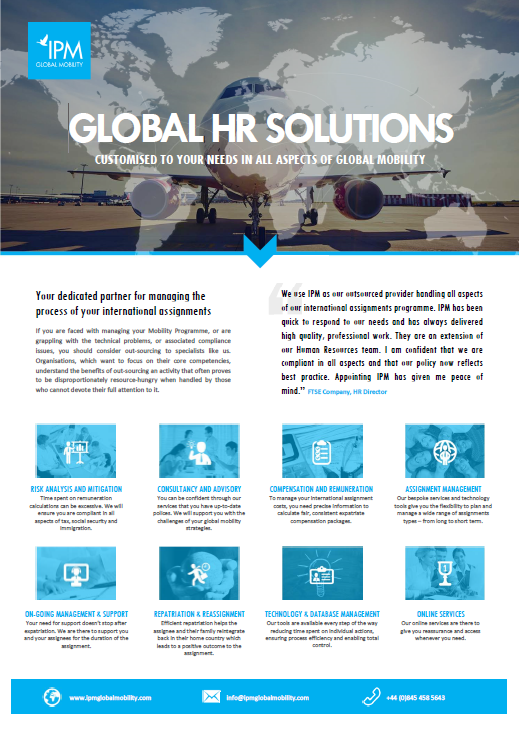 We work in the international HR sector, providing specialist HR, Tax and Relocation services and management tools, to businesses that employ people who are assigned to work overseas. We offer a unique range of innovative services and tailor-made solutions which have been developed from the wide ranging specialisms within the team, from consultant capability for developing Global Mobility Policy to immigration compliance, travel management and financial control. Compliance issues are often a good starting point and we are experienced at finding and empathising with pain points. This has resulted in creating long-term customer loyalty. We offer an end-to-end solution, but are equally able to provide support and solutions for clients at any point on the Global Mobility assignment cycle, filling in the gaps within the client’s experience or knowledge or where global mobility and assignment management is part of someone’s role. Working as an extension to your HR team, our services can be taken either as a whole or on a modular basis. This allows you the flexibility to outsource those aspects that are currently a drain on your resources and means you benefit in the areas where you need the most assistance. Download our one pager of our services to view the different parts of the full assignment management programme.